My kids love “Old MacDonalds” chicken nuggets. Truth be told, so do I. It was generally cheeseburger Happy Meals for me as a kid because 5 kids times the extra money to splurge for the nugget meal for each of us made McDonald’s not such a great deal for my parents. I never lost that childhood desire for the nuggets. Somehow they just seemed so much more grown up. So much cooler. Guess that marketing money McDonald’s forks out really pays off huh? For many reasons, a trip to the golden arches is not in the family plans right now – but I hate to deprive my sweet children their most favorite lunch. These nuggets totally made me a superstar to my kids for the day…or at least for a few minutes. They were practically dancing at the table in their excitement as I took the tray of lightly browned nuggets out of the oven. Served up with some apple slices and a few of the last homemade Cheese Its, we had a perfectly wonderful departure from our typical peanut butter and jelly sandwiches. No begging or pleading to finish lunch required! A little trick for getting your nuggets crispy all over, set a cookie rack (yes, the ones you cool your cookies on) on top of a baking sheet, spray well with cooking spray and then set the nuggets on top. Having the air able to circulate all around them while baking makes crispy delicious coating all over, instead of having to mess with turning them halfway thru the cooking time (which, I never remember to do until there’s about 3 minutes left on the timer). Also, drizzing with melted butter or spraying with a little cooking spray/olive oil spray prior to baking will seriously up the crunch factor as well. Cut chicken breasts into 1 1/2-inch sized pieces. Salt and pepper the chicken to taste. In a large Ziploc bag, mix together the bread crumbs, cheese, salt, thyme and basil. Mix well. Put buttermilk in a bowl or dish for dipping. Dip chicken pieces into the buttermilk, then throw into the bag a few at a time and shake to coat with the breadcrumb mixture. Place the well-coated chicken pieces on a lightly greased cookie rack on top of a cookie sheet in a single layer, and bake in the preheated oven for 20 minutes. For the last 5 minutes of cooking, turn the oven on to broil for a crisper crust. 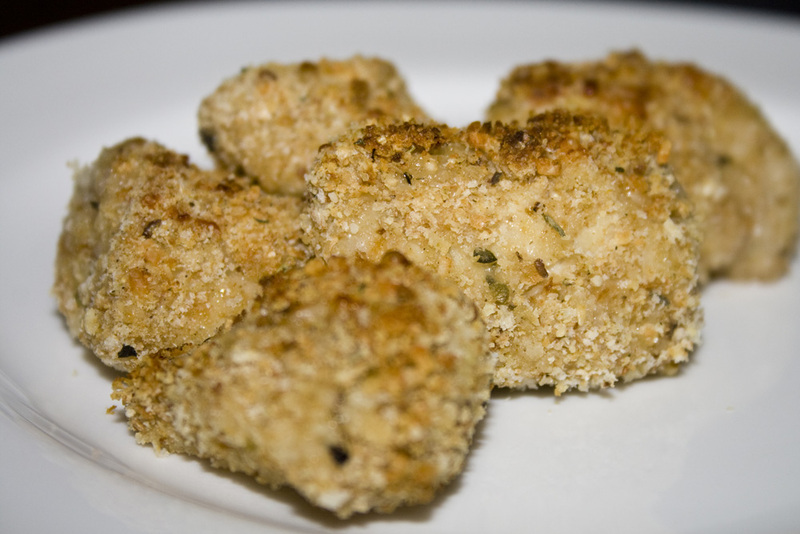 What wonderful nuggets – the looks super tasty. Indeed. Super tasty. I think next time I’ll make a bigger batch, and freeze half so my hubby has stuff he can make quickly for the munchkins if I’m not around.